Doctor Who: When Saturday Comes | Warped Factor - Words in the Key of Geek. For some of us, Match Of The Day is as much a part of Saturday evenings as Doctor Who. Clearly some bright spark recognised this, for a closer look at this season's title sequence reveals the presence of the Fourth Doctor amongst the footballing heroes of yesteryear! During his Second incarnation the audio story The Apocalypse Mirror reveals that he sometimes liked nothing better than a spot of keepy-uppy to pass a little time, his record number of consecutive touches being a rather disappointing five. 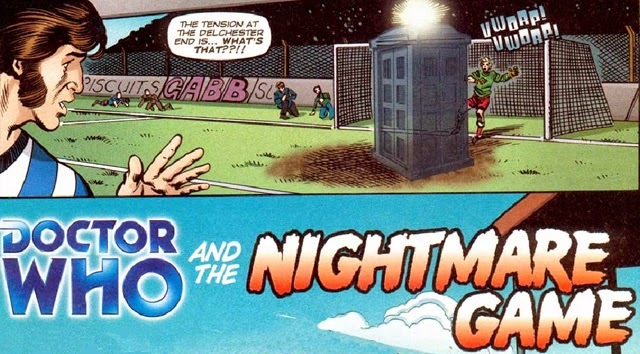 His games are abandoned after a stray kick sends the ball flying into the TARDIS console, damaging the harmonic resonator. Oh my word! ...No doubt helped by the fact Matt Smith showed quite some promise with a ball at his feet before an injury forced him to abandon a career in the game after spells with Northampton Town, Nottingham Forest & Leicester City. As an interesting side-note, just minutes after that particular episode finished the England vs USA 2010 World Cup match was just kicking off on ITV! 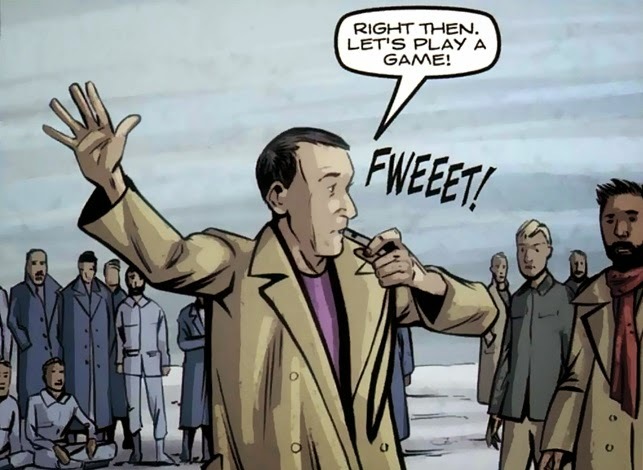 The Doctor also gets to show off some of his previous skill in The Power Of Three! The character of Roy Stobbs, Delchester's team captain, could be inspired by Roy Race of Melchester Rovers from the Roy Of The Rovers comic series, Stobbs helping the Doctor & young United fan Billy Wilkins to work out what's growing under Delchester's stadium & stop two Morg which have taken the human forms of Milo & Frank Shakespeare from carrying out their plan after managing to hypnotise Stobbs's team-mates. 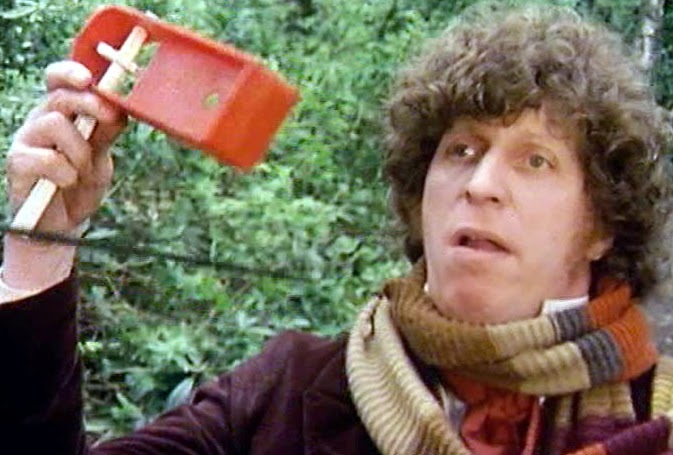 The Doctor also partakes in the enthusiastic use of a football rattle, just as he had four selves earlier to startle a horse in The Masque Of Mandragora. "United are in my blood. I was born in Salford, about a mile from the ground. And it's a family tradition; my dad Ronnie went to see them from the Thirties. Some of my earliest memories are of my dad talking about the Babes, specifically Duncan Edwards. 'He was a man at 16,' he always said. He was a great guy but kept his feelings to himself, but at any mention of that team he suddenly became filled with emotion. My mum was an Old Trafford trolley-dolly. She used to push a trolley round the inside of the pitch selling Bovril. Just recently she said, very casually, 'When we finished work we used to see Duncan standing at the bus stop after the game eating fish and chips.' Can you imagine Ryan Giggs doing that? My dad would talk about them as players while my mum talked about their personalities, like 'Roger Byrne's very good-looking but you can tell he's moody'. My dad took me to my first match: Bristol City at home in October 1973. It was a night match, which made it even better. If I ever have a son myself I'll try and take him to a night match as his first game because it's more magical. I remember feeling my dad's hand on my shoulder, everyone looking serious, the ground being all concrete and ugly, how huge the arena was, and never having seen grass so green in all my life. Bestie played and had a penalty saved. 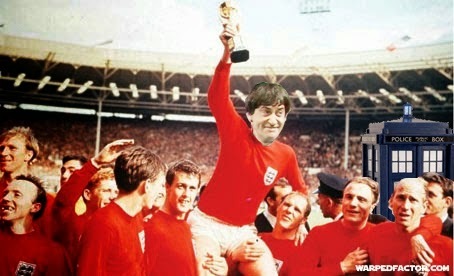 I'm convinced Denis Law tried a diving header and we lost - at home to Bristol City!" 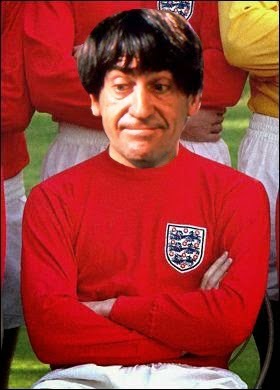 The First Doctor had earlier found himself caught up in the 1966 World Cup as he and Susan find a Blessing Star, an alien crystal which is able to give whoever holds it anything they might desire. With the thoughts of the whole country filtered through it, it helps ensure that a goal is scored- captain Bobby Moore will get to lift the trophy after the Three Lions beat West Germany 4-2 in the final! All of this takes place during in The Rag And Bone Man's Story, part of the Shirt Trips anthology. 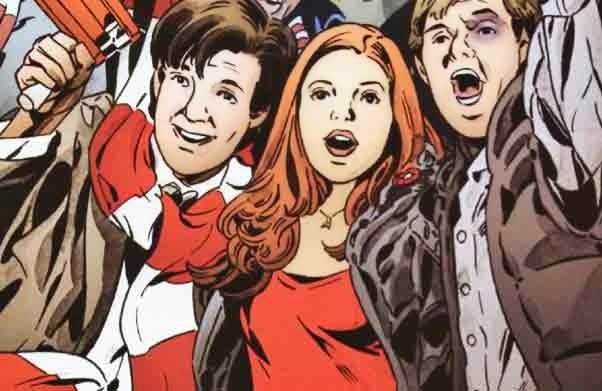 The Eleventh will later take Amy & Rory to watch the same match in the comic story They Think Its All Over. Player, spectator, what's next? Ah yes- refereeing! MICKEY: How many channels do you get? DOCTOR: All the basic packages. MICKEY: You get sports channels? 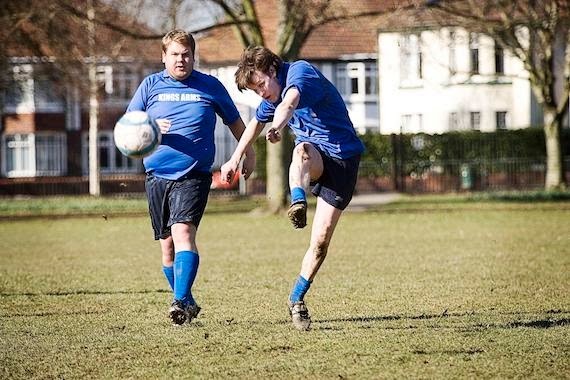 DOCTOR: Yes, I get the football. Hold on, I know that lot. MICKEY: What're you drinking, tea? Nah, nah, that's no good, that's no good. You're in shock. You need something stronger. MICKEY: Now, come on, you deserve a proper drink. We're going down the pub, you and me. My treat. How about it? ROSE: Is there a match on? MICKEY: No, I'm just thinking about you, babe. ROSE: There's a match on, ain't there. MICKEY: That's not the point, but we could catch the last five minutes. ROSE: Go on, then. I'm fine, really. Go. Perhaps little wonder she chooses to take the Doctor up on his offer of travels through the entirety of space & time! 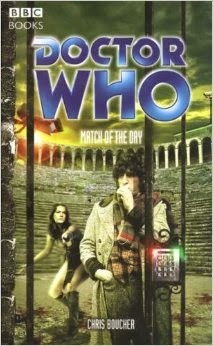 For the rest of us there's always 606, Sky Sports & the aforementioned Match Of The Day - also the title of a Fourth Doctor novel by Chris Boucher.